Fairfax County is looking to turn the forests around the Beltway-Arlington Boulevard interchange into Merrifield’s newest urban center. The Merrifield Suburban Center Task Force meets for the first time tomorrow (Tuesday) night at 7 p.m. in the Inova Conference Center at 3225 Gallows Road. The group is tasked with developing recommendations for the land surrounding the interchange on three sides. 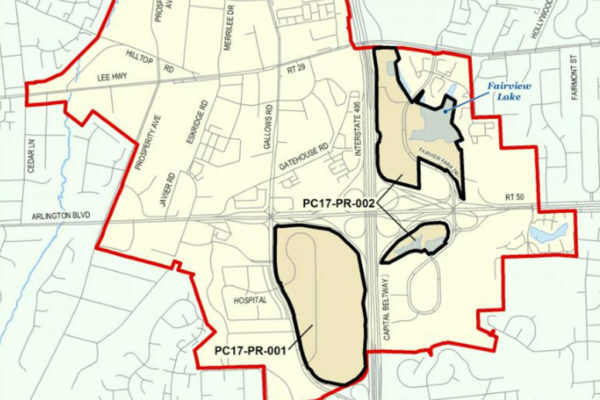 At the July 31 meeting, the Fairfax County Board of Supervisors initiated a process to review land use for 203 acres of land in the vicinity. Mixed-use office, hotel, and residential are all being considered as potential choices for development. The portion of the site to the northeast of the interchange is Fairview Park North, a parcel of land mostly wooded except for a Northrop Grumman headquarters and a few other office buildings. Fairview Park South, across Arlington Boulevard, is the smallest parcel of land and is mostly unused land north of the Falls Church Marriott. The southwest parcel is a wooded area surrounding the Inova Center for Personalized Health, which will remain on site. At tomorrow’s meeting, the Task Force is scheduled to review the existing conditions of the site. Transportation issues is the topic for a subsequent meeting scheduled for Nov. 13. A full schedule meetings is available online. The group is expected to deliver a final recommendation to the Board of Supervisors on April 23, 2019.